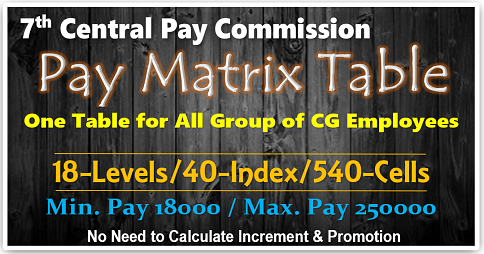 How to Calculate Your Pay as per 7th CPC Pay Commission? 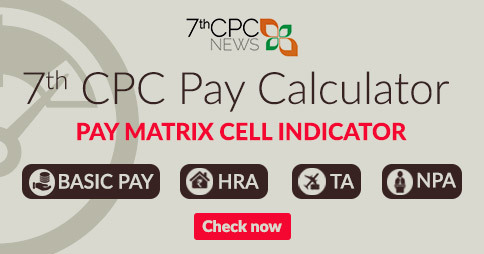 How to Calculate Your 7th CPC Pay through Online? 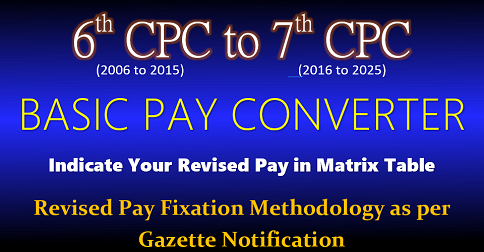 How to convert your pay from 6th CPC to 7th CPC? 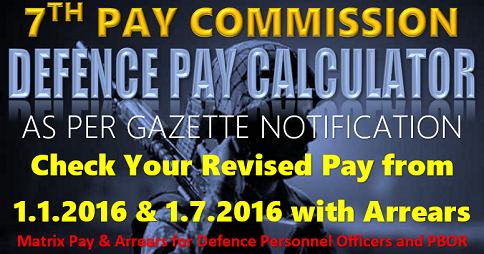 7th Central Pay Commission recommendations are implemented with effect from 1.1.2016 to all group of Central Government Employees and Pensioners including Defence Armed Force Personnel and Ex-Servicemen. 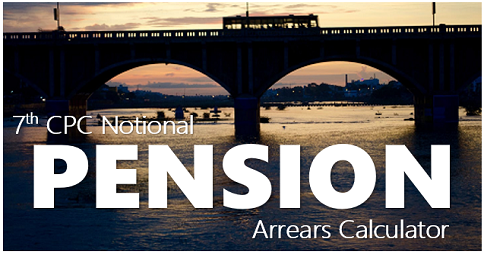 Almost all State Governments are followed the pattern of Central Government to its employees and pensioners with their convinience. What is the in-hand salary for PGT TEACHER in Jawahar navodaya vidyalaya ? Sir main up aided junior high school me clerk hu 6th pay me 1.12.2015 Ko GP 1900 BP 7360 basic pay 9260 rha. 9260 me 2.57 guna kernel pr 23798.2 aa rha hai jo najdiki talika me 23800 ke pas hai .kintu aap ke anusar 24500. Ho rha hai please baaye ye kaise ho raha hai. It is not MACP UPGRADED only pay fixation from 1/1/2016, after increment on 1/7/16 your pay is ₹ 24500/-. What the 1st pay of Doctors in central Gov. ,doesn’t this clause create a discrepancy of pay of doctors getting in service after 1 Jan 2016. Answer to UTKARSH : From the 7th CPC NPA for Doctors as 20% of their revised basic pay. ANSWER TO V.JAGANNATHA REDDY ; As per your pay scales of 3rd CPC at basic pay of 880 with 7 increments it was in 4th CPC as pay scale 2000-60-2300-75-3200 (S-13), in 5th CPC 6500-10500 (PB2), in 6th CPC 9300-34800 with GP 4200 and in th 7th CPC as notional basic pay of Rs.42,300/- as per 7th CPC matrix level 6, 50% of basic pay as revised pension as Rs.21,150/- w.e.f. 1/1/2016 plus applicable dearness relief at the rate of 2% from 7/16, 3% from 1/17, 5% from 7/17. 7% from 1/18 & 9% from 7/18. Also you are eligible 20% of addition pension with D.R. at the age if attained 80, if it is 85 age at it may be 30%, if 90 age 40%. 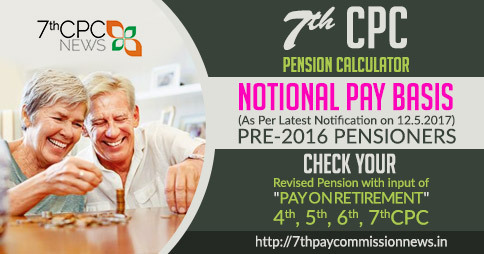 So far it was not revised contact your ex-employer/PAO/Bank because 90% of pensioners were got revised and got the arrears. 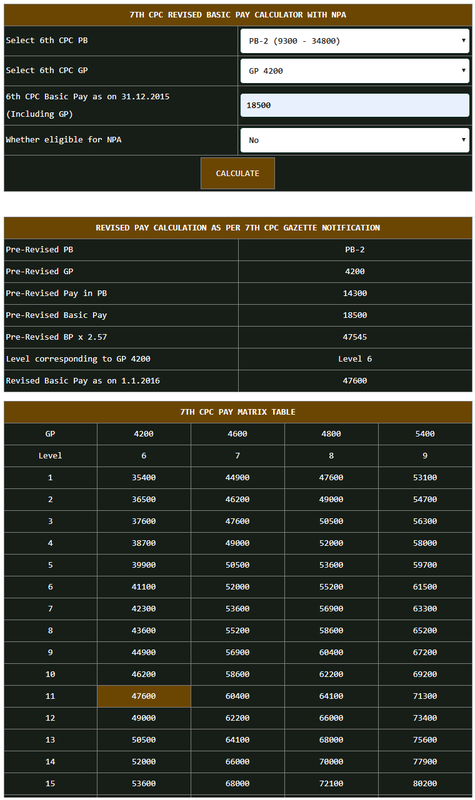 Answer to REEJU : LEVEL 6, BASIC PAY OF RS.35,400/-starting. 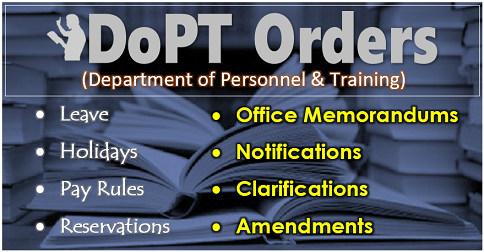 As per concordance table what will be .y pension as py 7th CPC please let us know.